Team Newton can perhaps not decide what to celebrate - its official entry to the Oscars or the box office crores it's fetching. 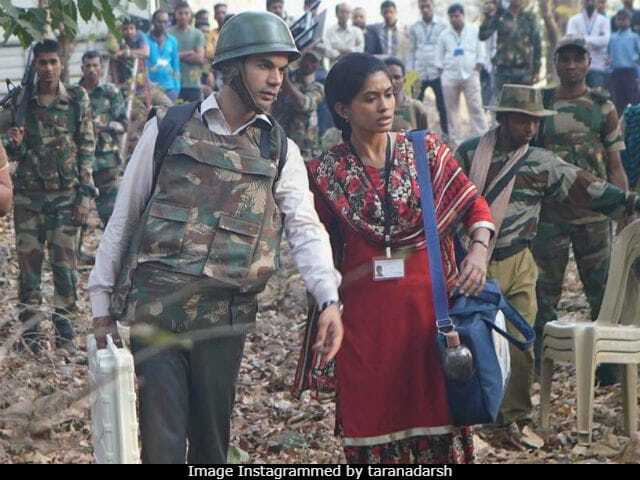 Rajkummar Rao's new film Newton released on Friday and has made a box office score of Rs 6.90 crore so far, reported trade analyst Taran Adarsh. The movie had an "impressive weekend," boosting its collection sales by a massive push on Saturday. Newton took off on a low note with barely a crore, and look at it now! "Starting on low levels on Fri morning, to packing an IMPRESSIVE total over the weekend, Newton has emerged VICTORIOUS at the BO," Mr Adarsh tweeted on Monday. Newton opened across 430 screens and has recorded the highest single day collections on Sunday with a decent sum of Rs 3.42 crore. "Newton is expected to maintain momentum on weekdays," Mr Adarsh added in his tweets along with a day wise break-up - "Fri 96 lakhs, Sat 2.52 cr, Sun 3.42 cr. Total: Rs 6.90 cr." #Newton is expected to maintain momentum on weekdays... Fri 96 lakhs, Sat 2.52 cr, Sun 3.42 cr. Total: Rs 6.90 cr [430 screens]. India biz. Directed by Amit V Masurkar, Newton casts Rajkummar Rao as a government clerk and Pankaj Tripathi features as an army officer. Soon after release, the movie found itself featuring in plagiarism related headlines for alleged similarities with Iranian movie Secret Ballot in terms of the subject and its treatment . However, Rajkummar's portrayal of the protagonist - Newton Kumar - has been critically acclaimed both by the audience and critics alike. In his blog on Newton for NDTV, film critic Raja Sen highlights the biggest challenge faced by the director while etching the character: "Newton, too, is set up by his silences. It is hard for a director and an actor to make a strongly credible character out of an observer who does not always express himself entirely, and Newton is a protagonist who spends an awful long time being quiet." On Friday, Newton released along with Shraddha Kapoor's Haseena Parkar and Sanjay Dutt's Bhoomi.